A DETECTRONIC DeteX-Pipe installed in your product line assures that you meet today´s HACCP requirements. When your products are well inspected your good reputation, your brand, and your customers are well protected. X-ray inspection increases product safety because it can detect metal contaminants better than any metal detector can do. Furthermore it can detect nonmetallic objects such as glass, stone, bone, rubber, high density plastic, and other high-density contaminants. DETECTRONIC DeteX-Pipe is ideal for inspection of pumped products such as jam, ice cream, juice, minced meat, sauces, etc. and because the X-Ray is not sensitive to changes in product temperature or moisture it ensures a minimum of false rejects. The DETECTRONIC DeteX Pipe is made of heavy duty glass blasted stainless steel. It is designed for easy cleaning, and has a revolutionary totally encapsulated hygienic design with IP67 /IP69K rating. The X-Ray is delivered with a user-friendly touch screen panel interface for easy operation. The equipment is designed to respect global radiating safety regulations without any use of lead. 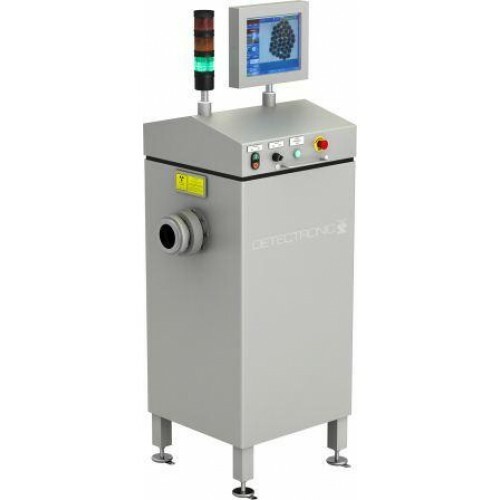 The DeteX Pipe X-Ray system is available in different pipe sizes for easy integration of the X-ray system into your current product line.